SaMaPa (Sopori Academy of Music And Performing Arts), the well known music academy and music organization of India by music legend Pandit Bhajan Sopori and music maestro Abhay Rustum Sopori, today announced the names of the recipients of this year’s prestigious SaMaPa awards, the exclusive national level honours pertaining to Jammu & Kashmir. The awards will be given on 26th of November 2017 during the 13th edition of SaMaPa Sangeet Sammelan, the topmost classical music festivals of Delhi, being presented in collaboration with Incredible India, Ministry of Tourism, Govt. of India and IFFCO. The announcement was made by the General Secretary of SaMaPa, music maestro Abhay Rustum Sopori in New Delhi. SaMaPa is a cultural movement translating from a deep-rooted vision of the great music legend Pandit Bhajan Sopori in creating a unique, unbiased and empowering national level platform for presentation, propagation, and teaching of traditional music and performing arts. SaMaPa is acclaimed as a Cultural Bridge of the State of Jammu & Kashmir with the rest of the country and to have created a new generation of music connoisseurs. ‘SaMaPa Vitasta Award’ is being conferred upon the veteran Tabla maestro Pt. Anindo Chatterjee (Kolkata) and vocalist Pt. Vinayak Torvi (Bengaluru) for their lifetime contribution to Hindustani classical music. The Award carries cash honour of Rs. 50,000 and is given to prominent personalities who have been an asset to our country in the field of art and culture for their unparalleled contribution to Indian art and heritage. The award has been named after the historical river Vitasta of Kashmir also known as Jehlum. The Vitasta represents the cultural ethos and rich heritage of the State of Jammu and Kashmir. It has been a symbol of love, harmony, art and culture and Sufi-Saint tradition. ‘SaMaPa Kala Vardhan Samman’ is being conferred upon Saptak, the cultural organization from Ahmedabad. The Award will be presented to Vidushi Manju Mehta, the eminent Sitar Maestro and founder member of Saptak, who will be felicitated for her lifetime contribution to Indian music. The Samman is a special award instituted to honour those eminent personalities, cultural philanthropists and visionaries who go beyond the conventional areas of working and contribute significantly towards the growth, development, and promotion and propagation of art and culture of the country. ‘SaMaPa Nund Rishi Samman’ is being conferred upon one of the greatest living anthropologist of the world Dr. T N Madan for his contribution to socio-cultural history of Kashmir. Dr. Rafeeq Masoodi will be awarded for his enormous contribution to Kashmiri Art, Culture & Language, and Waheed Jeelani, the renowned singer from Jammu & Kashmir, will be awarded for his immense contribution to Kashmiri music. The Samman carries cash award of Rs. 21,000 and has been named after Sheikh-Ul-Alam, the great Sufi Saint of Kashmir, a spiritual legend who’s contribution to Kashmiriyat is enormous. The award is given to the personalities with enormous contribution having done path-breaking works in the folk and regional culture. ‘SaMaPa Acharya Abhinavgupt Samman’ is being conferred upon Dr. Deo Datt Sharma (Jaipur) for his lifetime contribution to the field of art and culture as a music critic & writer. The Samman carries cash award of Rs. 11,000 and has been instituted in the name of Acharya Abhinavgupt of 10th century from Kashmir who has been an unmatched thinker, aesthetician, philosopher and an unparallel commentator of Bharatmuni’s ‘Natyashastra’. Acharya Abhinavgupt has been in the real sense the man of the millennium. ‘SaMaPa Acharya Abhinavgupt Samman’ is a special award given to music critics, musicologists, scholars and journalists in appreciation of their extraordinary work towards music and performing arts. ‘SaMaPa Sangeet Tejasvi Samman’ is a new award instituted by SaMaPa this year to be given to those individuals who have contributed significantly at national and international level and are promising legends in making of Indian music. The Samman carries cash award of Rs. 21,000. This year the Award is being presented to eminent Rudra Veena exponent Ustad Mohi Bahauddin Dagar (Maharashtra), eminent Flute maestro Chetan Joshi (Delhi) and well known Composer Jaspal Moni (Delhi). ‘SaMaPa Yuva Ratan Samman’ is conferred upon Rishi Shankar Upadhyay (Delhi) in recognition of his conspicuous talent and achievements in the field of Hindustani classical music (Pakhawaj). The Samman carries cash award of Rs. 11,000 and has been instituted to recognize, encourage and felicitate the young generation artists of the country who are doing exceptionally well in their respective fields. 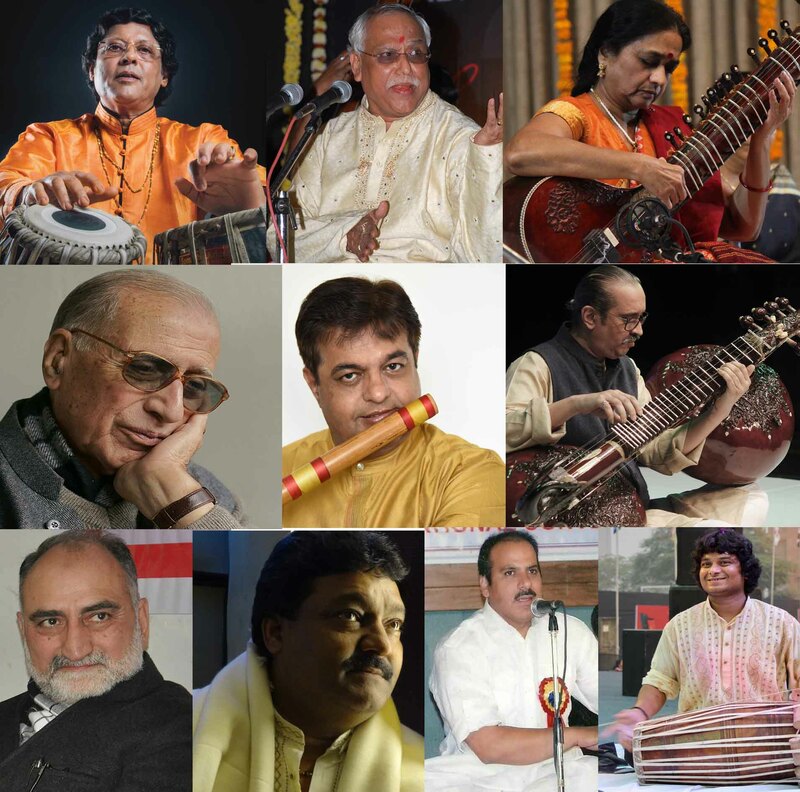 The awards will be presented during SaMaPa Sangeet Sammelan 2017 which is featuring some of the eminent musicians of Indian classical music including music legend Pandit Bhajan Sopori & maestro Abhay Rustum Sopori (Santoor), Pandit Vinayak Torvi, Pandit Vidyadhar Vyas, Kalapini Komkali (Vocal), Ustad Mohi Bahauddin Dagar (Rudra Veena), Vidushi Manju Mehta (Sitar) Chetan Joshi (Flute) and many others. The festival is also a gateway for the young musicians with exceptional talent getting their first stage in a prestigious festival along with senior legendary maestros of the country. This year, again a number of young musicians will be presented and promoted in the festival. The festival will also feature the Annual Painting Exhibition by the artists of Jammu and Kashmir. Apart from the SaMaPa awards, various personalities in the field of culture and those who have contributed to J&K art and culture will also be felicitated during the festival.